Runt grew up as the slowest, the weakest and of course still the smallest. Unlike him, his siblings were able to learn hunting skill fast. Then he just stayed and watched from den after he had been lost one day when he followed a hunt. Runt is both curious and inexperienced. He tried to search answers by himself. He wanted to make his father proud. Unfortunately he made mistake, a serious mistake that made him as an outcast. Nobody talked to him. Nobody cared wherever he went to. He hesitated until one moment inspired him to make a final decision for his life and his family, especially King. I love wolf and I love stories about wolves. I read some; some are fairy tales like Three Little Pigs and Red Riding Hood and some are fantasy novels like Twilight series and Chronicles of Ancient Darkness series. At the first time, I judged wolf is a cruel animal (result of reading Three Little Pigs and Red Riding Hood). I was confused and wondering why wolf is always judged like that. I believed there is something good about it. Then I found Twilight and Torak stories. Slowly but sure I changed my mind that wolf is a great animal. Yes it is wild as animal. I think animals are wild, aren't they? 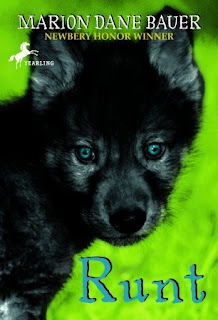 After reading this book, I became more aware about wolf. Bauer as the writer, gave her readers afterword after the story. She exposed her analysis about wolves' life a little bit. And based on it, she made a beautiful story 'Runt'. This story made me almost cry. I could feel Runt's feeling. If I were Runt, I might do and feel the same. Finally, I love Runt and his story. Congrats Bauer, you had written awesome story for us and of course especially for our children. Ulasan ini diikutsertakan pada FYE; Fun Year Event with Children's Lit: Fun Month 5 oleh Bzee dan Book in English RC oleh bunda Peni.